This is a story about Rotarians in Canada. And Rotarians in Kingston. It’s about one Akeem Stephenson, who wanted to go to jail. He believed it was the only way he could free himself from a life of crime - a life he desperately wanted to change. 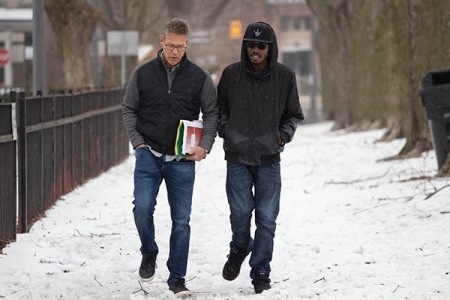 After being arrested a fourth time more than 10 years ago, for aggravated robbery, the teenager in Toronto was set to go to prison. But the judge saw something in Stephenson that suggested that he could redeem himself. So he gave Stephenson a choice: participate in an 18-month youth program, or serve the six-month sentence. For Stephenson, the choice was clear. He decided to transform his life through the PACT Urban Peace Program. PACT, which stands for Participation, Acknowledgement, Commitment, and Transformation, is a Toronto-based, award-winning charity supported by Rotary clubs in Canada. It works with at-risk young people and those who have committed crimes to change their direction in life. Entrepreneur and Toronto Rotary member David Lockett co-founded the program more than 20 years ago. The intensive, step-by-step program aims to break the cycle of poverty and criminal behavior. Its goal is to determine what the participants need and develop strategies “to put them on a positive path in their life, so they can enrich not only their own lives, but their community,” says Lockett. PACT works with the judicial system to identify repeat offenders ages 12-19 who may benefit from the program. After a young adult is convicted of a crime, the judge or judicial official refers them to PACT as part of a probation order. Central to PACT’s success is its LifePlan Coaching program, an intense intervention system that pairs a participant with a certified life coach. The two meet each week for 12-18 months to set goals in six key areas: education, employment, health, relationships, contributing to the community, and staying out of the criminal justice system. Many LifePlan Coaches are Rotarians. What, you say, does this have to do with Kingston North Kitsap Rotary? Well, it’s a small example of what Rotary Clubs the world over are working on in their communities on a daily basis. Often, the focus of Rotary’s leadership, lead donations, and sweat-equity is youth. Programs to divert young lives from a path to nowhere. As did our colleagues up north for Akeem. Here in Kingston, one of Rotary’s goals is to assist in the establishment of the Kingston Coffee Oasis in the former community center. It, too, is about youth. Coffee Oasis was formed in 1997 by Dave and Cindy Fredrick in Bremerton. It is a Kitsap-centric enterprise. Simply put, they sell coffee in the front to help kids in the back, providing resources for street youth. Showers. Laundry. Clothing. Food. Job training. Case management. Shelter. “Changing the world for homeless youth, in one community after another through evidence-based youth programs supported by sustainable coffee business.” That’s Coffee Oasis. Kingston North Kitsap Rotarians are proud to thank, in this month of Thanksgiving, all who raised their paddle for Kingston’s Coffee Oasis at June’s Swing for Rotary golf tournament dinner/auction. A total of $15k was raised. Welcome to Kingston Coffee Oasis. In addition to leading with donations of money and sweat-equity to your cause, we are pleased to welcome you and your youth-saving programs to our community. Kingston North Kitsap Rotarians are people of action. We take the lead on programs, activities, and initiatives that make this a better place to live. We would be pleased to invite you into our Club. We have fun and fellowship on the way to making this a better community. Weekly meetings, Wednesdays, 11:45 a.m., Village Green Community Center.